So, you may have gathered from my recent Goodreads updates that I’ve been somewhat preoccupied with this author called Andrea K Höst. It was Estara who gently nudged me into reading the Touchstone trilogy (STRAY, LAB RAT ONE, and CAZSANDRA), and I’m very glad she did, because I would have never have discovered Ms Höst’s writing otherwise. And I’ve been reading little else over the past few weeks. Andrea Höst’s books have been the sort that lingered in my mind for days afterwards, with the characters and their world feeling almost real. There’s been passages I’ve re-read several times because, well, just because. And what I love is that each and every one of her stories has been refreshingly different from other books out there. On her last day of high school, Cassandra Devlin walked out of exams and into a forest. Surrounded by the wrong sort of trees, and animals never featured in any nature documentary, Cass is only sure of one thing: alone, she will be lucky to survive. The sprawl of abandoned blockish buildings Cass discovers offers her only more puzzles. Where are the people? What is the intoxicating mist which drifts off the buildings in the moonlight? And why does she feel like she’s being watched? Increasingly unnerved, Cass is overjoyed at the arrival of the formidable Setari. 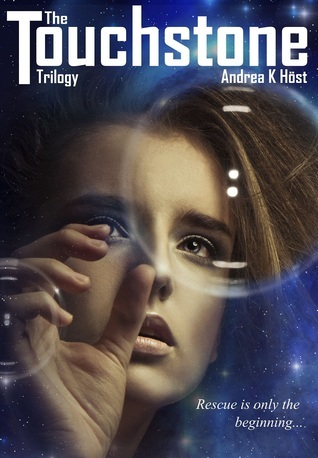 Whisked to a world as technologically advanced as the first was primitive, where nanotech computers are grown inside people’s skulls, and few have any interest in venturing outside the enormous whitestone cities, Cass finds herself processed as a ‘stray’, a refugee displaced by the gates torn between worlds. Struggling with an unfamiliar language and culture, she must adapt to virtual classrooms, friends who can teleport, and the ingrained attitude that strays are backward and slow. Can Cass ever find her way home? And after the people of her new world discover her unexpected value, will they be willing to let her leave? When I started in on Cass’ story, I wanted to very strictly keep to the diary format – an entry for every day of her year, even the dull days! Fortunately I then set out to give Cass the least-dull year imaginable. Diary format puts the reader very strictly into Cass’ thoughts and opinions. If she doesn’t realise something, she won’t mention it. She has no ability to discern who is “important” to the story and so readily mentions all the people she meets, even if that’s the only time the reader will ever see them. This resulted in a story which many readers find very ‘real’ and relatable, but at the same time assaults them with dozens of named characters, and offers pacing which does not match the traditional novel structure […] Cass is learning about the world she is in, and the reader only learns about what she chooses to write down – and she foregrounds early on that she is self-editing to a limited degree, leaving out some of her more miserable and upset moments. Basically the story is about Cass making a space for herself in this very different world, helping to beat the bad guys, and oh yes, falling in love. Ha – of course there’s romance. It’s the sort of romance that sneaks up on you – from a slight impression (and not a necessarily favourable one at that) in the first book to an “actually, you’re pretty central in my world” feeling*. That kind of organically growing attraction works so much better for me than a love/lust at first sight thing. And I could not put my Kindle down until Cass’s romance reached its conclusion (second book, if you’re wondering). Another part of the appeal of this book, I think, somewhat plays into the wish-fulfillment fantasy – who wouldn’t want to be the one special person who could save the world with a crack team of psychic space ninjas dedicated to keeping you safe. This aspect could so have easily moved the story into pure Mary Sue territory, but for a couple of things: firstly, Cass’s pragmatic nature, she herself admits to how this could so easily be wish-fulfillment (yay for self-awareness) and secondly, it’s not easy for Cass. Cass feels homesick, she struggles to adapt to the new world with language and cultural barriers, she’s not as physically fit as the Setari – so no, she’s not always having the time of her life. Yet I think that’s what makes it easier to identify with Cass and root for her to win through. I also love the world-building in this one – in fact, having read a couple of other Höst stories, I think that’s one of her strengths. Creating unique worlds without masses of info-dumping, instead sneaking in bits and pieces of information until the reader gets it – that, and just being able to come up with something different. There were some things that bothered me slightly – the first being more thematic, while the others were less important. On the first, Cass ends up playing guardian to a couple of refugees and essentially setting up home – I did think Cass was a bit on the young side to take on that responsibility, but on the other hand, she (and the Setari) was in the process of saving their world, so I suspect age does not come into it that much. Forever-type HEAs are problematic when the protagonists are teenagers**. Other minor niggles: a few repetitious character descriptions throughout the books, though I give this a pass as I fell in love with the characters anyway, and also the numerous names. Ms Höst gives her characters gender-neutral names which added to the sense of “otherness”, but it didn’t help me in keeping them straight, and this was made worse by the fact that the Setari tend to use different names on and off-duty. I got the main characters straight, but ended up confusing the secondary ones. I also will say that the second and third book pretty much dive straight into the story without much background. I normally expect more of a “story so far”-type recap in sequels – this particular quirk didn’t bother me as I was reading the omnibus version anyway, but be warned if you pick them up separately. All in all though, this book – flaws and all – had that indefinable magic that puts it firmly on my keeper shelf. I am now (happily) exploring Ms Höst’s backlist – which has veered more towards traditional high fantasy than Touchstone – but with the same storytelling flair evident in Touchstone***. And oh, her Medair duology may even be better than Touchstone. * Slight spoiler: The relationship in this one reminds me of the sigh-inducing romance in Diana Peterfreund‘s Secret Society Girl series (which just happens to be one of my favourite ever relationships). ** Though having said that, I recently reread Sherwood Smith‘s A POSSE OF PRINCESSES (after Thea’s review @ The Book Smugglers) and thought that had a perfect yet realistic ending for a YA romance. *** I should also note that there is a Touchstone epilogue titled GRATUITOUS EPILOGUE, which is just that – a freebie the author offers on her blog for those who want to know what happens after the trilogy’s conclusion. The description sums it up perfectly. I could have not read it, but well, I dare you to finish the Touchstone trilogy and not cave in. And the tongue-in-cheek title works – gratuitious is the perfect description for this. It’s great when you find an author or a series you fall in love with. Seems like this is what happened to you Li 🙂 I’ll definitively be checking out… eventually LOL. And I seriously need to read Diana Peterfreund. Thanks for the reminder! Ha – I will keep on reminding you about the SSG books now and again. And yes, I cannot wait for the next Andrea Host book to be released now. Is it going to be part of this series? or new series? New – standalone I think. It sounds like a YA fantasy, I like the cover! That’s another Julie Dillon cover – like the one for Champion of the Rose. I really like her art. She won a Chesney Award this or last year, if I remember correctly. I just googled her website – very nice! That’s a great review which I hope you’ll put up at GoodReads too, because the omnibus hasn’t gotten many reviews yet. But her name is Andrea K. Höst, as you so clearly linked ^^. Oh that’s the cover, Li? I keep seeing it in Goodreads! It’s really a great cover. I want to read it LOL. The HUNTING cover? I’ve never seen it on GR myself!